Our dedicated team deliver prestigious parties, curating the best party atmosphere and most memorable events possible. 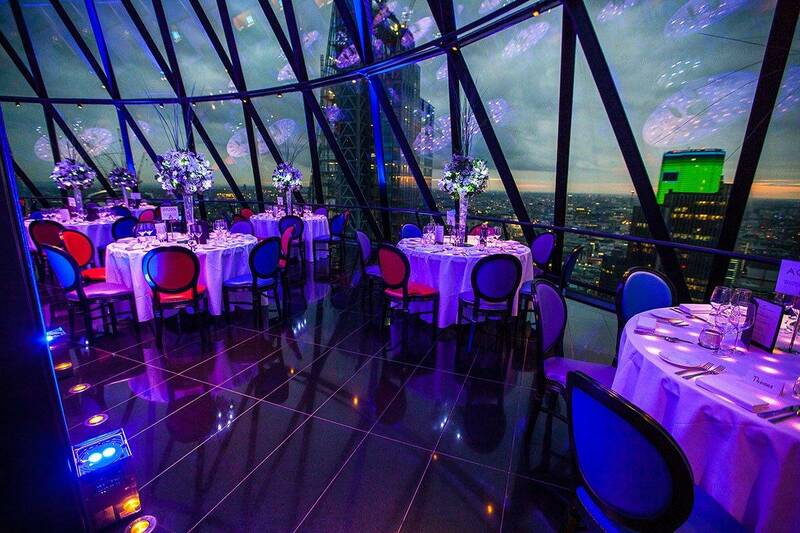 Here’s our selection of top London venues to consider for seriously stunning 50th birthday party celebrations. This iconic structure offers the ultimate room with a view for fine dinning and dancing 40 floors up. In this venue we delivered this beautifully styled, fabulous and memorable party. Fantastic private members club on Shaftesbury Avenue. We’re huge fans of the Green Room for sit down meals or dancing, and the Roof Terrace and Cocktail Lounge for socialising. Exclusive private members club on Portman Square. Use the Front Parlour for welcome drinks, dinner in the Eating Room then back to the Front Parlour for the remainder of the party. We love The Garrard Room under the soaring silver arches of the Belfry’s grand dome. Mirage party planners are experts at transforming blank spaces to create the very best party environment and atmosphere. Close to the Kings Road, Fulham, this contemporary venue offers blank studio spaces that are ideal for transforming into fully immersive environments for themed parties. The studios were also ideal for styling this sophisticated party with impressive nightclub. We’ve produced wonderful parties in the iconic Great Room (with the epic ‘Progress of Human Knowledge and Culture’ painting by James Barry for art lovers) and the private basement Vault spaces with stunning exposed 18th century brickwork. This exquisite 1920’s Art Deco Venue has versatile and flexible spaces. 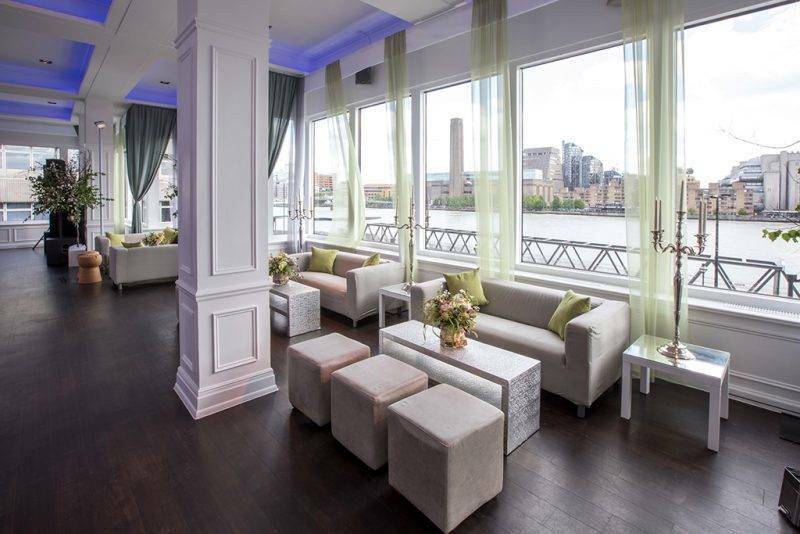 The River Rooms, with panoramic London skyline views, are stylish and contemporary event spaces. We produced this light, airy and modern party at this venue. Prestigious, celebrated and iconic – these distinct London hotels are worthy of your landmark celebration. Choose your event rooms to compliment the theme and styling of your party. The Pompadour Ballroom in this Regent Street hotel is a grand and ornate space with pillared outdoor terrace. The sumptuous décor works with opulent themed parties like this Gatsby inspired party. True 5 star Mayfair hotel, on the world famous Park Lane, with the largest capacity event space in London. We know this venue well having producing a prestigious event in the Great Room and the Ballroom every year for the last 30 years. Choose the Music Room for soaring windows that fill the room with natural light, and an intricately detailed shallow-arched ceiling. The Private Dining Room is luxurious space tucked away in a discreet area of the hotel. The Pinafore Room is one of the Savoy’s original private dining rooms, with views towards the Thames. Nestled in London’s bustling theatre district, this Covent Garden hotel is a gem. 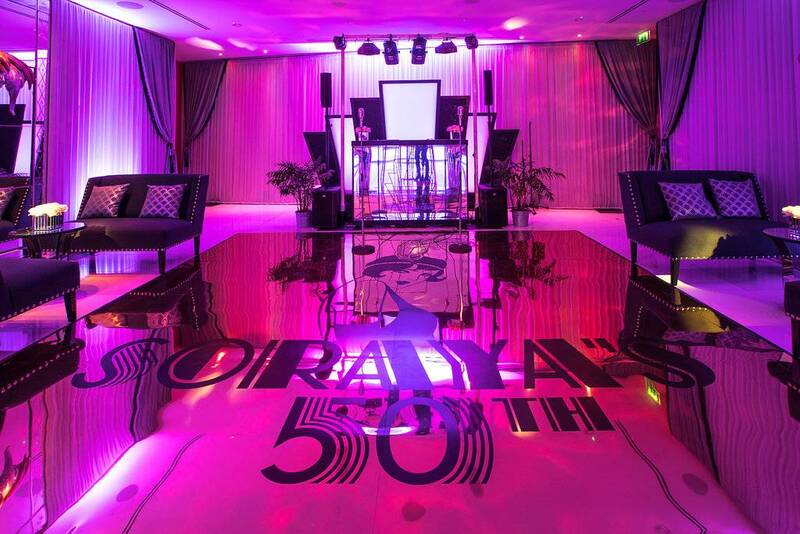 With lavish styling we transformed the Studios in the hotel for this exquisite 50th birthday party. The French Salon & Drawing Room with original Art Deco features winged Renaissance-style cherubs above the doors. For views of the Thames and London skyline. We’re excited by the 12nth Knot rooftop bar – which was known formerly under the guise of Rumpus Room. We love the Crystal Suite, a contemporary room with private entrance lobby featuring a dramatic sweeping staircase. Surprise birthday party, Hotel Cafe Royal, London. An alternative option is to consider a greenfield sites – undeveloped land or industrial barns – or the grounds of your home for your party. Modular and multi-zoned structures work well for creating intimate seating areas, bars and chill out lounges. Vast and open plan marquees create options for spacious dining, socialising and dancing. You could even have your own private luxury pop-up nightclub built for you for your party. 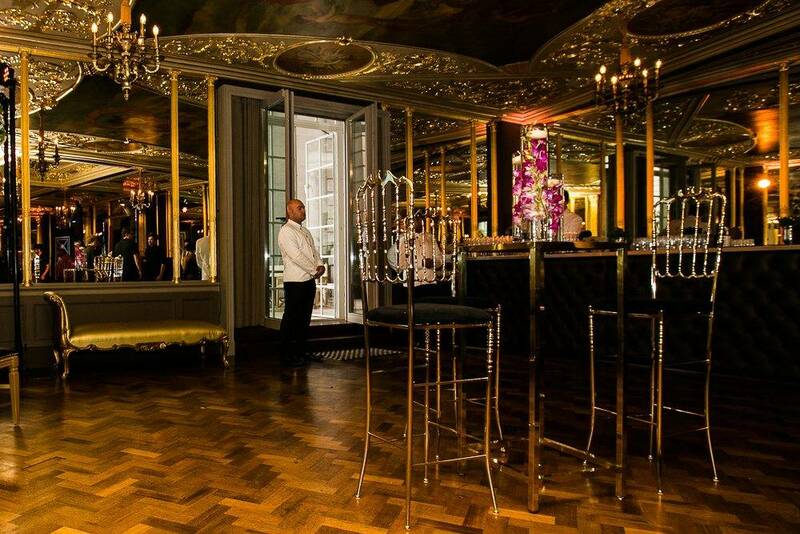 Mirage are experts at sourcing the very best venue for your party in London, across the UK and internationally. We’ll help you to see the potential of new and exciting spaces. Our longstanding relationships with many great venues ensures you get the best on offer. Mirage provide a discrete and personalised full party planning service, including event design, production and management. We manage the entire party planning process from venue sourcing, technical production, styling and lighting to entertainment and catering. Leaving you free to enjoy your guests and your party. Mirage Parties have decades of luxury party planning and event management experience and a proven track record for limitless creativity and flawless event production.